I saw several signs this morning: “Free Coffee in honor of National Coffee Day”. Instead of looking for a free cup of coffee today, I suggest you go the other way: Try a coffee a notch above what you usually purchase. You might be surprised by its taste, its aroma. If you like cream and sugar, go ahead. It should still taste better yet. My thinking is this: The average coffee farmer lives hand-to-mouth, paycheck to paycheck. Actually, since more than half the world’s coffee is grown by small family farms, there really aren’t paychecks. There are no holidays, no sick days. The family works the farm every day. The farmer usually grows multiple crops. The coffee is a paycheck once it’s delivered. It’s a tough business model. I doubt there are any hotel seminars in coffee growing countries teaching how to break into the profitable coffee growing business. The average coffee grower’s age is near 60. It is physical work. You and I might think of sustainability in terms of our wish to be able to obtain quality coffees in twenty years; the middle class “will our children know what a true Ethiopian Harar tastes like?” kind of concern. Whenever I’ve asked farmers what sustainability means to them, they wonder if they’ll be growing coffee next year. Period. No romance about keeping an heirloom coffee going for posterity. Most of the world is still stuck in survival mode. All that free coffee being pedaled today is the lowest-quality coffee. It’s only a bargain because those who create it are not getting paid a fair wage. Since I know better than to preach morality, I’ll preach self-interest instead. If you taste a great coffee today, won’t you want it tomorrow? The coffees I’m talking about are more likely to be available because someone made money, their bills were paid and they will grow more next year. Even if I’m just thinking of myself, I want to taste the best every year I have left on this planet. Speaking of sustainability, it goes further than growers. The folks who roast and then brew it in your local coffee hangout work for their wage, too. As someone who regularly pitches buying exhibit space at my traveling CoffeeCon event, I think they’re also facing sustainability issues. Most of them are following the 80/20 rule — 80% artist and 20% business, and they literally go into the red to get the top coffees you and I enjoy so much. Maybe toss an extra dollar in the tip jar to help keep the barista sustainable as well. So, my advice: Splurge in honor of National Coffee Day. Give yourself one you’ll truly remember. Should you Jump on the AeroPress Coffee Bandwagon? Much like Coffee Kevin, our crew tests and evaluates every brewing gadget large or small and we share our feedback. Some equipment is strictly for commercial use: Does anyone need 240 cups of coffee per hour at home? Maybe, it depends on how many coffee drinkers live with you — I know that I could put a serious dent in that! Some coffee crazes easily translate from commercial cafes to your kitchen counter, yet due to sheer volume or prohibitive cost, some do not. In conjunction with the World Barista Championship that was held during the Melbourne International Coffee Expo in May 2013, another (much quieter!) competition occurred: The World AeroPress Championship. Now here’s a coffee trend that everyone can try on for size. The initial set up for this brew method runs about $150 for an AeroPress coffee maker, pack of filters, variable temperature kettle and kitchen scale. All you need to bring to the kitchen table is a little caffeinated curiosity, your coffee and a cup. Jeff mentioned he favored bolder coffees for use in the AeroPress so we chose a flavorful espresso blend that we regularly enjoy. 17 grams corresponds to about 1 rounded AeroPress scoop, but we weighed ours to be certain of the measurement. His grind, however, is somewhat controversial: Unless something was lost in translation, he reportedly used a coarser grind than drip, while conventional wisdom has the grind somewhere between espresso and fine drip. Water temperature is not what you’d expect either. The familiar 200F temperature threshold is not achieved and it still creates a proper extraction. You can experiment yourself to confirm this. With a variable temperature kettle it is easy to get the right (lower) temperature for extraction. You could also use a regular kettle with a glass measuring cup and an inexpensive drink thermometer. We placed the AeroPress over a double-wall glass mug and it was beautiful to watch and listen to the resulting coffee droplets. In about five minutes, we had a single cup of coffee with the AeroPress from start to finish. The aroma was a little more subtle, but the coffee was smooth, even and full of sweet caramel notes — just as we had hoped. The included AeroPress instructions indicate for two scoops to fill the tube with water to the (2) measure and to make a concentrate rather than filling to (4) with this dosage. The resulting concentrate can then be diluted (as if!). Even with her predilection for up-dosing and lack of dilution, she brewed a cup that was not bitter or sludgy. You have to love a device that still operates well whether you follow the printed directions or not. Besides price, taste and ease of use, there is also the portability factor: It is lightweight and virtually unbreakable. The AeroPress is a practical option for anyone who would like to take his or her fresh cup of Joe on the go. I have heard tales of AeroPress prepped successfully in campgrounds and college dorms — even on a commercial airliner mid-flight! The aftermath is also manageable to clean because the spent grounds are pushed out after the extraction and it is fairly solid like an espresso puck for easy disposal. A quick hot water rinse and occasional soft scrub are all that is required to clean. While any coffee brewing method can be taken to scientific extremes, the versatility of this simple plastic device continues to amaze. Right side up, inverted, pre-infusion, paper versus metal filters –you can try all of the tricks of the trade to see what tastes best for your coffee or espresso blend. What I’ve outlined here are just two of a seemingly endless number of variations. The AeroPress is fun to use and that should come as no surprise since it is from the same Stanford inventor behind the Aerobie Flying Disc. While it may be easy to dismiss the device based on looks (think Habitrail meets water pipe), it makes a seriously good cup of strong coffee. Recently, my local cafe started offering house roasted single origins prepped via AeroPress; I can’t think of a more glowing endorsement from the world of specialty coffee. For home or cafe, the AeroPress is here to stay. Don’t knock it till you try it! We are living in a golden age of coffeemakers. Just a short while ago I honestly could not say this, but today I can and the biggest innovations are happening in automatic coffeemakers. It used to be the Technivorm and Bunn, and the industry didn’t understand the Bunn, so it was really just the one machine among the elite. Today there are several that meet high enough standards to motivate me to write a comparison to help make up your mind. Please read the in-depth reviews as they appear, but I wanted to get something out to clarify them side by side. • Meets goal of brewing in under 6 minutes contact time. The Bunn and Behmor machines take longer from the time you press the button, but that’s because they’re designed to heat the entire water amount first, but none over extracts like so many automatic drip machines from other manufacturers. • Brews at industry standard brewing temperature: 200° F.
• Gets the grounds properly wet. Here is a profile of each, containing my observations for each machine. I’d be happy with any of the brewers in this group. Not one of them need apologize for being an automatic drip machine. Although I can already hear manual drip enthusiasts saying none could replace their Hario or Chemex, you might be surprised after tasting some of the coffee I’ve had from each of these machines. I know that this or that function might be more controllable using manual methods, but any of these can produce an excellent cup of coffee. In some ways they offer more control, and certainly more consistency. So here you have it… the closest I get to offering a shopper’s guide. To the manufacturers who aren’t listed. I apologize but I will add anyone’s machine as they qualify. They must brew a full batch in under 6 minutes, get the water heated to the above-stated specification and get all the grounds equally wet. When you pick up a bag of Kona blend coffee how much Kona coffee do you think is inside? I would guess most folks would guess around 80%. How about 50%? 10%? It may interest you to know at Safeway for years it has been an honest 5%. I say “honest” because apparently there is no real coffee blend percentage regulation. Kona coffee farmers complained. They feel that the product bearing their origin name on it should be labeled with a percentage breakdown. Last year, Safeway voluntarily agreed to a Hawaiian Department of Agriculture request and pledged to increase the Kona percentage in their Kona Blend to 10% and reflect it on the package. Kona farmers weren’t thrilled with the change, but at least it was in the right direction. Their latest complaint is that nothing appears to have changed at Safeway. The farmers claim Safeway is not keeping their word and that consumers are still buying coffee that’s only 5% Kona and 95% commodity blender quality coffee in the old unmarked bags. Safeway’s answer? Safeway vice president of public affairs Brian Dowling says, “Given the product shelf life, packaging used before the (changes) may still exist on store shelves or elsewhere in our distribution chain,” then added that that the company doesn’t plan to destroy or dispose of those products. I am surprised to hear anyone at a food supplier say their company doesn’t plan to destroy or dispose of old perishable products. I guess my followup question to Mr Dowling would be, “Ever?” So, the 5% Kona blend is still on their shelves because it’s still well within the freshness range they accord the product. To me their defense is more alarming than the original charge. They agreed last year. Does this means that all these bags on the shelves were packed and labeled before 2012? That seems like a long time, even by a supermarket’s standards. What kind of coffee flavor can there be in a product this old? Just to give reference, coffee is best consumed within 2 weeks of being roasted. Assuming it is packaged in an oxygen-free environment in proper packaging, some large-scale roasters in the industry claim it can preserve its flavors for up to six months, although there’s dissention even within their ranks. I would argue after twenty years of personal tasting that coffee is good for me for about a month after roasting, regardless of packaging. Only freezing significantly slows the staling of coffee beans and this is still controversial. So Safeway is saying, relax we’ve still got plenty of coffee so old it predates our year-old pledge right there on our shelves. Nice. None of this is about safety, so I’m not pushing new laws. This is about taste, a company’s in-house freshness standards and their word. I don’t blame the farmers for asking for more, but I’m going to offer a quick guide to getting your money’s worth when you shop for coffee. 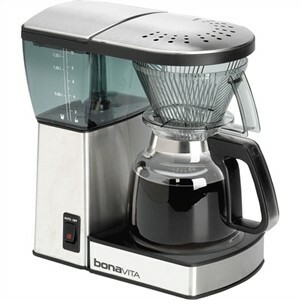 Bodum has always been known to produce the very best in manual drip methods especially the French Press. This year they’ve decide to take everything they’ve learned about manual drip brewing to create their own version of the automatic drip coffeemaker. While I haven’t tested this new coffeemaker yet I got a first hand demonstration at the 2012 International Housewares Show in Chicago. I can already tell you that I like the idea of the see through design that shows off the quality electronics inside. So take a look at the video presentation I created until I can review this new coffeemaker in my own kitchen.